Another scorching Toronto summer is almost upon us. If you’re dreading another summer without air conditioning, or if your portable window unit has seen better days, it might be time to think about a ductless air conditioning system for your home. If you live in an older structure and are tired of having only one or two air conditioned rooms, a ductless air conditioning system might be the perfect solution to keeping your entire home cool during the hot winter months. Many homeowners don’t want to go through the hassle and expense of installing ductwork for a central air conditioning system; the costs are high and the work is time consuming and messy. And, you don’t want to go out and buy yet another window unit that will only cool one room at a time. It’s finally time to consider ductless air conditioning for your home. Why? Believe it or not, ductless air conditioning is cheaper to install and will save you money on energy costs. Most ductless systems use less energy than standard central air conditioning systems. Plus, you never have to worry about dirt and debris building up in ductwork, or the problem of having hot and cold spots in your home due to poor air circulation. 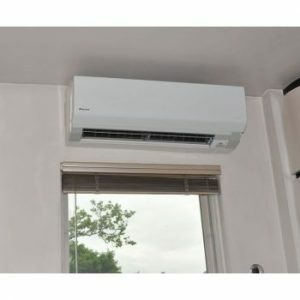 A ductless air conditioning system consists of an outdoor cooling unit connected to one or more indoor units depending on the size of your home. The units are mounted high on the walls in your home so they will not interfere with your home’s decor, nor will they prevent you from opening windows the way portable air conditioners can. If you’ve reached the point where you need an alternative to window air conditioners and you don’t want to install a central air conditioning system, now is the time to consider ductless air conditioning for your home. You’ll stay cool and keep more money in your pocket for things that really matter. For more information about whether a ductless air conditioning system is right for your home, give the experts at Heating Ontario a call at (click-to-call): 647-591-2683.